What If Asked “Enter Password to Unlock iPhone Backup” But You Forgot the Password? I run into a rather weird problem: When updating my iPhone 5 and trying to restore the backup file to the new version, iTunes asks “Enter the password to unlock your iPhone backup file”. What a hunk of mess! I never remember iTunes asked me to set a password for my backup file! Where the password comes from? Maybe more than one iPhone user encountered this question! And it is really a rather headache question! Is It Impossible to Find the iPhone Backup Since You Have No Clue of the Backup Password? No! It is not really the truth that you can’t unlock your iPhone backup file when you don’t have the password. Firstly, you can try your fortunate to enter the right password to unlock your iPhone backup. Find all sorts of passwords you ever used in various cases. Such as iPhone lock code, Apple ID code, birthday numbers, phone numbers and even “0000” “1234” and so on. Be patient, and enter as many passwords as you can. At least this is a free method, and deserves a try! What if you are not so fortunate, and can’t meet the right password? Don’t worry, there is a specialized tool – iPhone Backup Unlocker. It is a powerful iTunes encrypted backup password recovery tool which can help you find the iTunes backup password even you have no idea of your backup password. Its Brute-force attack can help you hack the password in any case. 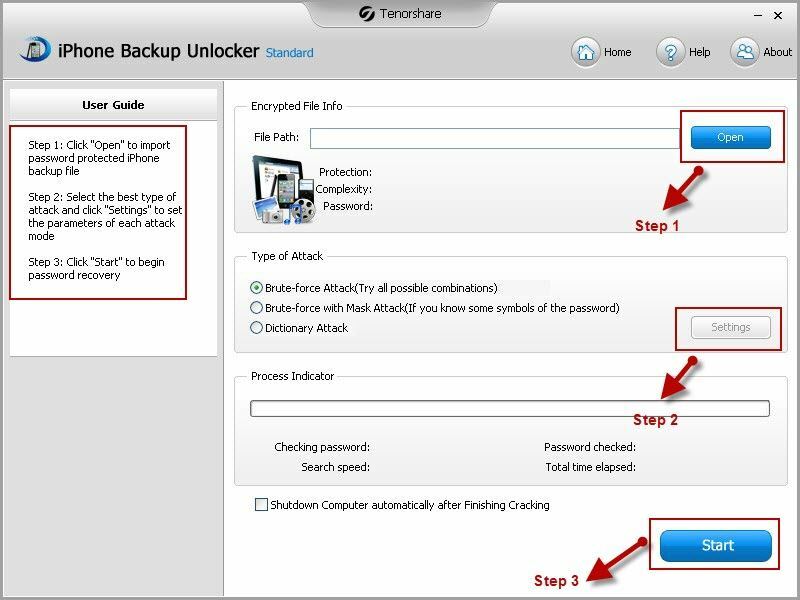 How to Use iPhone Backup Unlocker to Find Your iTunes Backup Password? This iPhone Backup Unlocker is an easy-to-use tool and you don’t need to have any special skil to operate it. All you need to do is to download the iPhone Backup Unlocker, install it on your PC and launch it. Follow the steps below and the prompt given in the interface, you can make your iPhone backup password recovery easily! Step 1: Import the iPhone backup file. When the tool automatically heads you to the destination directory of the backup file, “Open” it. Note: If it failed to detect the backup file automatically, you can manually find the backup file, the backup location is told in the article: Where is iPhone Backup Location. Step 2: Choose a proper attack type, if you have no clue of your password, the brute-force attack is recommended. And there is a detailed description of the 3 attack types provided by this tool. Step 3: Start to recover the iPhone backup password. When done, the password will display in the File Opening Password Box. Then you can enter the password to unlock your iPhone backup file.